According to sources Cyanogen has confirmed that they have a new hardware partner. Meaning a OEM running a CM ROM out of the box. This is great news for the developer community as we have all, known and loved the customization possibilities the CM ROMs provide. They were not willing to give any more hints as to who the new partner is, but according to rumors there is a high chance it could be Oppo, as they already have a device that comes with CM ROM out of the box, the Oppo N1. We are in the final preparation stages for CM 11 nightlies as well – you crackflashers will have something to play with soon. For those who do not know CM 11 is based on the all new Android 4.4 KitKat OS. If you want to have a feel of it there is an unofficial CM11 build that you can try out. Be warned though it is a bit buggy. The developers at Cyanogen Inc. have been busy building ROMs and apks. Recently they have come out with a test version of a screen recording app and AirPlay Mirroring which is similar to Miracast found on most high end devices. This basically helps you display whatever you are seeing on your device on a bigger screen, when connected on the same wireless network. Even though the apk is still in beta testing stage, you can have a crack at it from the download link below. To use screen recording, it is very similar to screenshots. Instead of volume down + power (screenshot), press volume up + power. A notification will pop up that notifies you that your screen is being recorded. You can enable showing touches, and also stop the recordings. Recordings are saved to /sdcard/MirrorRecordings. To use airplay mirroring, go into Settings, displays, Wireless Displays. It will scan for airplay devices. Pick one, and it will mirror your screen. There’s some bugs with the NSD Service in Android itself, which I need to fix. Causes hard hangs/NPEs in the framework. So if your airplay stops working after a while, a reboot will fix it. 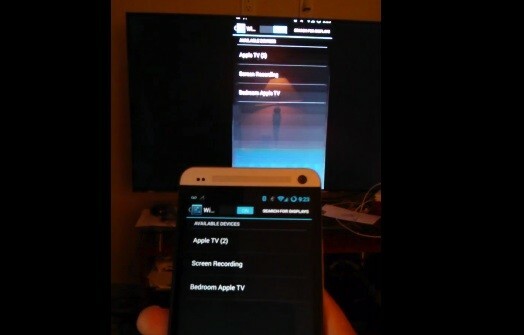 This will NOT work on any devices that don’t support MiraCast, like the Galaxy Nexus. Your phone is too damn old. So Cyanogen Inc has been really busy and seems we are in for a few surprises in the coming week. Be sure we will be covering when anything comes up. Smart-phones, Smart-watches and now a Smart Ring. What does the future hold for us next?